Sufferin Succotash! 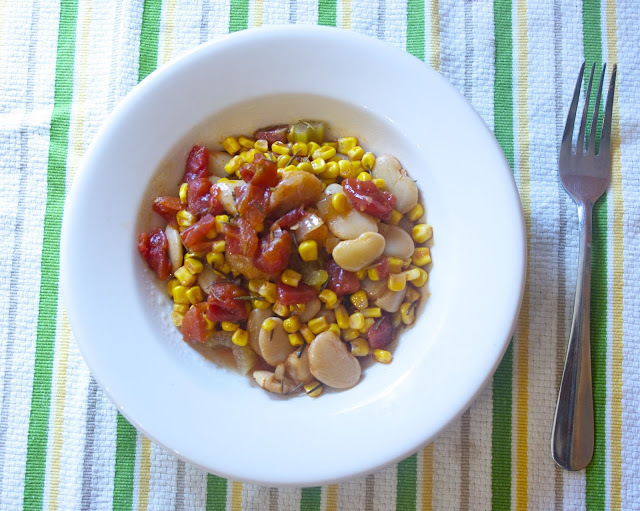 it is summer time and what better vegetarian meal to make then succotash. Filled with all the flavors of summer: corn, tomatoes and lima beans... so delicious on it's own, or as a picnic side... hot or cold. Traditional Succotash is just one of the many easy and healthy recipes found in Judith Finlayson's book "The Vegetarian Slow Cooker: Over 200 Delicious Recipes." This cookbook contains recipes for slow cooker breads, breakfast, soups, pasta, beans, and desserts. Summer is the perfect time of year to add more vegetables and more vegetarian meals into your menu routine. I love using the slow cooker in the summer because it is super energy efficient and gives off very little heat, so your house doesn't get heated up like it does from turning on the oven. The other great thing about using a slow cooker in the summer is...say you have a busy day. Put everything in the crockpot in the morning and when you return in the evening you have a meal waiting for you. 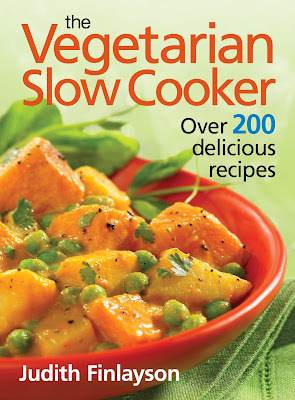 Slow cooker vegetarian cooking will keep you healthier, thinner and save you money... because you won't be tempted to pick up take out! If you prefer, substitute 4 cups (1 L) frozen lima beans for the dried ones and skip Step 1. Use the type of paprika you prefer, sweet, hot or even smoked. The results will be different, but all will be good. This dish works best made with a robust vegetable broth such as Enhanced Vegetable Broth (Variation, page 103). If you don’t have time to make Enhanced Vegetable Broth and you think your broth may be lacking in flavor, add a bit of vegetable bouillon powder, but be aware that you may have to reduce the quantity of salt in the recipe. Complete Steps 1 and 2. Cover and refrigerate for up to 2 days. When you’re ready to cook, complete the recipe. Made with freshly picked corn, succotash has become a late summer and autumn tradition. This makes a large batch, but it keeps well. 1. In a large saucepan, bring beans to a boil with 6 cups (1.5 L) water. Boil rapidly for 3 minutes. Turn off heat and let stand for 1 hour. Drain and rinse under cold water. Using your fingers, pop beans out of their skins and transfer to a bowl. Cover with cold water and set aside. Discard skins. Drain beans before using. 2. In a skillet, heat oil over medium heat. Add onions, celery and carrots and cook, stirring, until softened, about 7 minutes. Add garlic, rosemary, salt and peppercorns and cook, stirring, for 1 minute. Stir in tomatoes with juice and vegetable broth and bring to a boil. Transfer to slow cooker stoneware. Stir in lima beans. 3. Cover and cook on Low for 8 hours or on High for 4 hours, until beans are tender. 4. Scoop out 1⁄4 cup (50 mL) of cooking liquid. Place paprika in a small bowl. Gradually add hot liquid, stirring until smooth. Add to stoneware and stir well. Stir in corn. Cover and cook on High for 15 minutes until corn is tender and flavors meld. Stir in cream and Parmesan, if using, and season to taste with nutmeg. 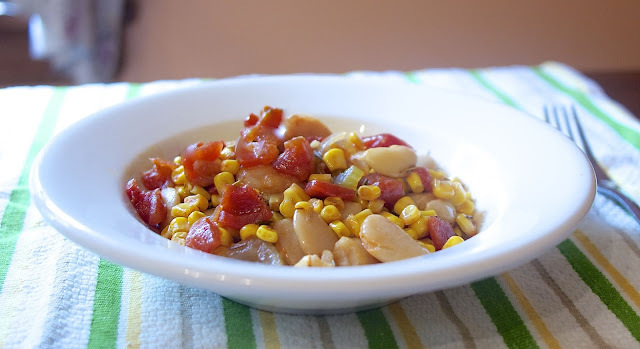 Lovely succotash recipe, Diane - it looks delicious! I really like the sound of this book! I am using my slow cooker more and more these days and I like the idea of this great vegetarian resource! Because of all the BBQ and picnics in the summer. I try to make our weeknight meal be more healthy and vegetarian in the summer. Looks like we both love Succotash, I really like the rosemary in your recipe. Thanks so much for sharing this awesome recipe with us at Full Plate Thursday!